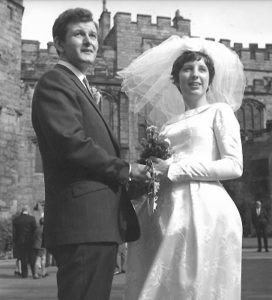 Richard graduated in June 1969 and he and Christine married the following September, so this year they will also be celebrating a golden wedding anniversary as well as 50 years since graduating from Durham. “I was raised in Oldham where there are no trees. There was a magical moment when, visiting Durham for my interview, I saw the Castle and Cathedral in snow and carried my cheap suitcase across Palace Green by lamplight and knew this was where I had to study. I obtained a degree in Law and Sociology and in due course became a barrister (incompetent, alas) before ending up doing legal and commercial work in the international construction industry, which gave me a wonderful opportunity to tramp shiftily around communist Europe when it was still in black and white, and generally have fun to no great purpose that I ever discovered. I wrote ‘The Hitler Diaries’ and in due course a total of 13 novels and two non-fiction works. They were internationally published and I was nominated for the Booker Prize. And, no, I’ve never heard of me either. These days I give lectures on the general theme of Frauds and Charlatans on the principle of “it takes one to know one”. 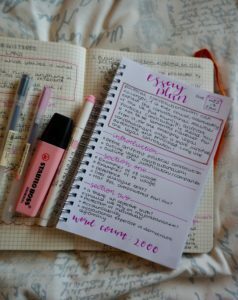 I also lecture on how to write an autobiography. 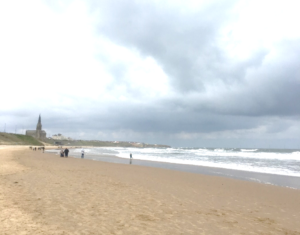 “Going up to Durham in 1964 to study German with Russian subsidiary, I was part of the first group of about 25 Freshers at Hatfield College to be housed in the new annex at Shincliffe hall, about 2 miles south of the City. We soon became a very sociable group with breakfast and dinner in the hall and lunch at college. From Christmas, we were given special dispensation to bring up a car, which about four of us took up. The second year was spent sharing a room in the old Jevons building before demolition. After returning from my year in Germany at Plön, I had the luxury of a large room with an adjoining bedroom – with a washbasin! 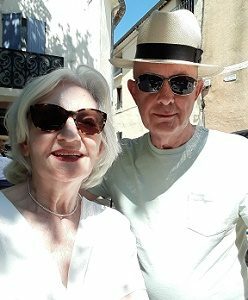 Gill started at St Hild’s in 1965, taking a degree in English, Theology and French, one of about a dozen degree students at the then Teacher Training College who intended eventually to become teachers. She has fond memories of being placed in Lightfoot House on the Bailey in her final year. We met for the first time when we stayed in to do our PGCE for secondary education. I and a fellow Hatfield postgraduate student rented the back of a cottage in Cornsay Colliery, then a ‘Category D’ village due for demolition, about 8 miles from Durham, with the metal numbers for 32½ on the door! Gill enjoyed Alma House (now no longer owned by the college) at Hild’s. At the end of September 1968, we were placed for three weeks teaching practice in a primary school. 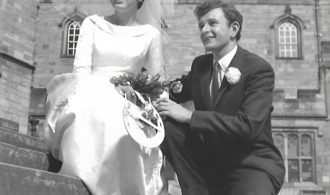 When our names were read out in the Appleby lecture theatre for Langley Park Colliery Primary School, we both stood up and introduced ourselves to each other – we were engaged the following year and married in March 1970. The photo above shows us at our graduation. Although it may not look like it, we did not know each other – just caught on the same photograph! Our careers moved very quickly, both becoming Heads of Department in large comprehensive schools in 1974. When our daughters were born in 1977 and 1979, Gill took a short break and I moved on to a Deputy Headship, eventually becoming Headteacher of Poole Grammar School. Gill resumed teaching and quickly returned to Head of Department and then a senior teacher at Parkstone Grammar School in Poole. 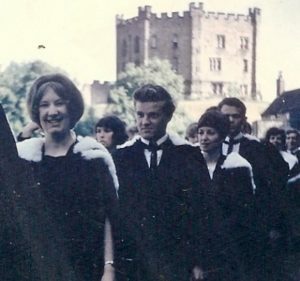 Watch out for more memories of Durham from the Class of 1969 tomorrow. The University will be awarding three Honorary Degrees during Winter Congregation. Visit our news pages to read about recipients of this year’s awards.